The late Satoru Iwata contributed much to Nintendo's history. While it's easy to remember him for his more recent accomplishments in the Wii and DS eras, many are aware that Iwata's time at the company has lasted for much longer; he got his start as a part-time programmer at HAL Laboratory in the 1980's. This earlier part of his life isn't nearly as well known, so a book was recently published that delves deeper into his younger days. 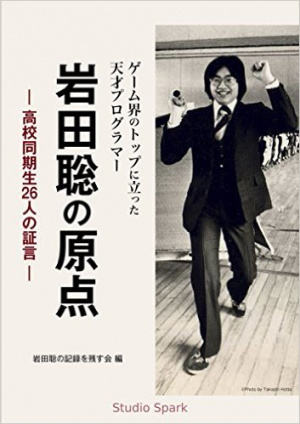 The book is a collection of anecdotes and information from 26 of Iwata's former classmates in High School and College. It's available on Amazon as a Kindle book for ￥690 (about $7), though it's only in Japanese as of time of writing. Perhaps if it's successful enough, there'll be more translations made or additional volumes written. For those of you that are interested, you can check it out here. What do you think? Does this sound interesting to you? Drop us a comment in the section below. If they translate it to English, sure, I'll get it. But for now the only memorabilia I have of Iwata is anything Nintendo up to 2016 that he has produced. The man must been born in a suit. @PaperMario64 Could you repeat that, I'm not sure you got the point across. @Not_Soos I think the man was born in a suit. @MitchVogel Ah, m'kay, now I get it. @PaperMario64 At least I had the chance to give you three likes for a great "funny cause it's probably true" post. Interesting book, that, but I kinda shudder to think if my classmates got interviewed for a book about me. Which of course will never happen, but it's something new to have nightmares about. I'd buy it if it got translated. I'm going to have to pick that up. Need to charge my kindle first. I'd get it if it was in English. Glad someone decided to chronicle his history, Iwata was such an original dude. I still miss him and his wackiness. Do the publishers have a website? I'd like to know whether they are planning a physical release. Or at least any ebook format other than Kindle. It (LOL, not he?) was called a genius programmer. The late Satoru Iwata of Nintendo before the President. In the middle of the personal computer was even no 1975's how computer and encounter, whether learned programming? Classmate 26 people testimony drew to the original everyday and in the school of high school, from "calculator baseball game" of illusion. Nonfiction approaching to its origin. "Testimony collection because by the people of Iwata's classmate, as there is also in the title, the content is not rare that does not come out first in the normal book. At the same time, rather than the one book I can recommend never even "introductory book follow the entire footprint of Mr. Iwata" specific to anyone. I think whether it is better that were considered supplementary reader specific positioning of enthusiasts with a decent knowledge. Without any volume is never many being based on it, people to your attention because the expertise is also by no means high of to testify." Clearly, another masterwork by Google Translate. In any case, though, it sounds like this book doesn't tell us much about Iwata the Game Developer, Programmer, and President, so much as it tells us about Iwata the High School and College Student. So take that for what you will.